I am kind of doubtful about this fling. I hardly ever do that swirlies one. I don’t know why, it’s kinda fun to do. Although it’s weirdly hard to force yourself to draw them going the other way for variety’s sake. Maybe I’ll bust them out more for Eliza, she seems like a swirl bg fill kinda gal. Well. Eliza is certainly seems fun. She’s a blast and a half. If by “fling” you mean Eliza flung Larry’s eye off his face then yeah, they totally had a fling. Doc. This is a rare occasion, so listen carefully to what I am about to tell you. This woman is even more of a psychopath than you are. Listen to your instincts. Listen to them and imitate your spirit animal. Wizard. Coward. Runs away from danger yet is always in the thick of it. Rincewind is a coward; that’s the inherent part of his nature that makes the stories go ’round. He runs from everything… usually getting himself in bigger trouble when he does it (or accidentally solving the trouble, sometimes). Does Dr. Schtein come across as a coward? Hah, that’s funny. He just seems like a goofus to me. Very unaware of his surroundings. Don’t be fooled by the coward thing. Goofus totally works for Rincewind, too. They share this survivor trait: a tendency to keep falling into horrific situations they quite naturally want to escape from. With great horror comes great desire to flee. Their desire for peace & quiet ruined by their being catastrophic/exciting event magnets. Still just so happy the updates are back. Been reading this since 2010 I think, so despite all his…charms, I may be rather fond of Stein. I also love how far your style has come since starting this adventure. Damn since 2010? That very near the beginning. I think I started in 2009. It’s actually hard to tell because I didn’t used to use wordpress (I used to make all the update pages by hand, I know, right? ), so the dates in the first chapter are probably screwed up. Wow drawing ths ribs inside that umbrella must have been a pain! Amazing job! I totally forgot about that! I even read through everything while Grundy was off working on stuffs. Thanks for the refresher! Maybe we will glean what happened during their… violent flirting? Lets hope Grundy has that gem planned for sooner rather than later, eh? I sure hope robot eyes are harder to pluck out. Strong magnet on a string aught to do the job! I don’t trust her with that last panel’s face. So Grundy? 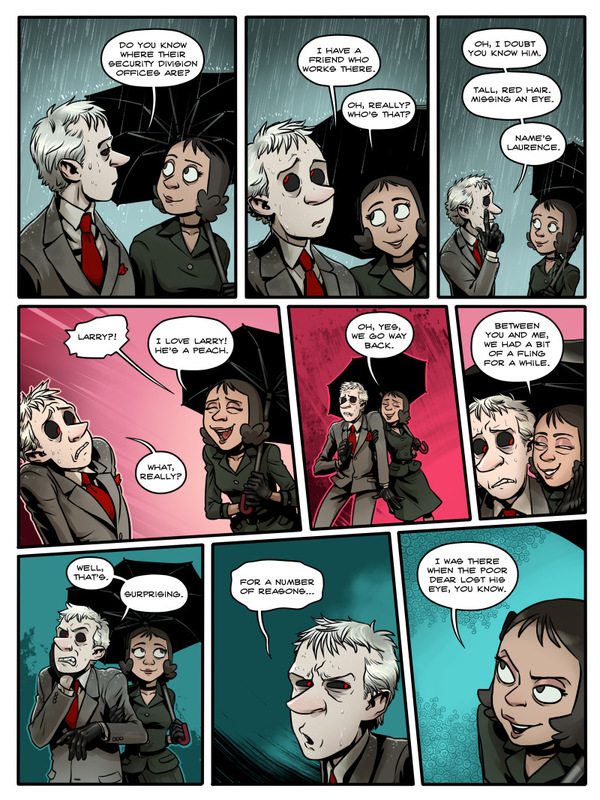 What is it that Laurence’s eye is has only been brought up on page 18 of different chapters? Both chapter 3 and 7 now! Is there some freaky link or just happenstance?